A multijurisdicational drug task force integrates local, state, and federal law enforcement agencies and prosecutors for the purpose of facilitating investigations, enhancing interagency coordination, and sharing intelligence in multiple jurisdictions. The goal of the drug task forces is to reduce the local availability of illegal drugs. With the development and maintenance of 13 separate drug task forces, a statewide approach to combat Oklahoma's drug enforcement problem has been established. Through the drug task forces a unique localized drug enforcement response has been created. Drug task forces provide additional manpower and equipment to local law enforcement agencies to investigate illegal drug activity. Often, local law enforcement can not afford to assign the personnel needed to investigate drug related crimes. Through the drug task forces, approximately 60 investigators work on narcotics investigations throughout Oklahoma. There are additional local law enforcement officers assigned on a full-time basis that work in tandem with the drug task forces and a large number that assist as needed. Collectively, the drug task forces represent the largest drug enforcement body in Oklahoma. To locate a drug task force in a specific county, click here. Drug task force investigators receive specialized training which allows them to investigate, collect evidence, and dismantle clandestine methamphetamine labs. 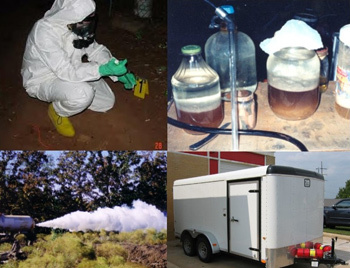 The labs are generally poorly ventilated, volatile, and contain incompatible chemicals and solvents that are often times stored together in unmarked containers, making the situation ripe for fire or explosion. Drug task force investigators receive hazardous materials training and equipment that allows them to safely carry out the needed dismantling activities. 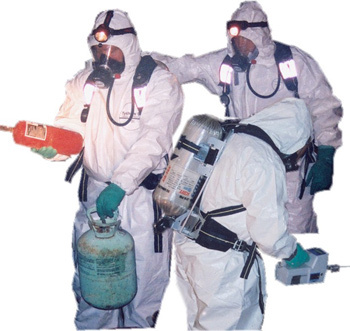 Investigators use air monitors, self-contained breathing apparatuses (SCBA), protective suits, and respirators to protect themselves from the unknown conditions within the clandestine labs. Pseudoephedrine, found in most cold medicines, is a core ingredient in making methamphetamine. In an effort to control the prolific methamphetamine problem, Oklahoma was the first in the nation to pass legislation which identified pseudoephedrine as a Schedule V controlled dangerous substance. Since April 2004, Oklahoma statutes require that all pseudoephedrine products be dispensed by a licensed pharmacist or pharmacy technician. Liquid preparations and liquid filled gel caps are exempt and may be sold in retail stores. Customers are limited to nine grams of pseudoephedrine during any 30-day period. Customers must sign a log which lists the date and amount purchased. This restriction has made an enormous impact on the number of clandestine methamphetamine labs seizures in Oklahoma. It has also impacted the local availability of methamphetamine.